Denomination : Silver denier. Mint : Antioch. Reference : Metcalf Crusader 348 class B. COINS OF THE CRUSADER STATES - page 205 to 206, #28 (square A and V, anulet). Size : 15.5 x 16.8 mm. Weight : 1.17 grams (heavy for these). 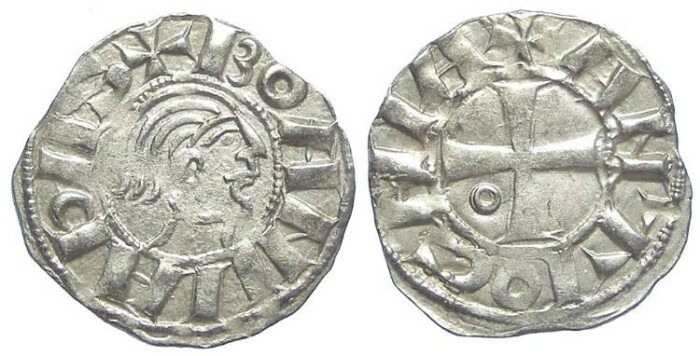 Obverse : Bare head of Bohemond III, with long hair, with BOAHVNDVS around. Reverse : Short cross with an annulet in the lower left, all within a circle, with ANTIOCHIA around.